Brock: What is your earliest memory of fishing? Who introduced you to the sport? Gillespie: I was 4 or 5 when my Dad took me pier fishing for Perch. Salt water fishing is still my favorite, there is nothing like catching Calico bass. Brock: When did you start fishing in the freshwater? 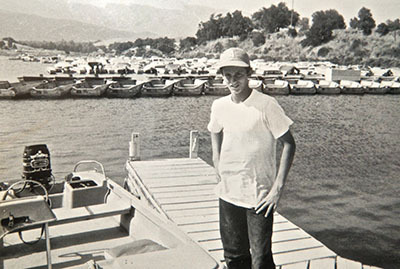 Gillespie: Back in the 60�s at Hansen Dam located in the San Fernando Valley in Southern California. It was pretty much a mud hole, but in those days my buddies and I spent a good part of our summers there. I had an old South Bend two piece rod with a Mitchell 300 reel, a few crank baits like Sonics, Hell Benders, River Runts, and Hula Poppers to name a few. We would show up at the lake early with no food or water and fish until dark with not much to show for it but I loved it. The few bass I caught made me love it more. There were other lakes also, Casitas, Sherwood, Piru, and of course Castaic which I fished from the day it opened in the early 70�s until I moved to Northern Cal in 1997. Brock: When did you set your sights on chasing trophy Bass? What lakes did you target? Gillespie: I have to go back to the early 80�s for that question. One cold January day in particular I traveled to my home lake (Castaic Lake) for a day of spooning bass in 80 feet of water. I went to my spot and shut down my boat and began to rig a couple of sticks, by the time I finished the wind had blown me within a few yards of the forebay dam. This was an area that I loved to throw crank baits on, in the spring. I thought what the heck I probably won�t catch anything, but I�m going to go ahead and crank down the face of the dam to get warm if nothing else (throwing a Poe's 400 cedar crank). I ended up catching 5 or 6 solid fish in the 2 to 4 pound range which were bigger than the fish I was catching spooning in the 80 foot water and a lot more fun catching these at about 10 feet. Being very pleased and surprised I ran to some other water I liked to crank in the spring which was in a deep feeder creek arm. I began cranking my way in and not having any luck until I got within about 200 feet from the very back where dirty cold water was running in and caught a 2 pounder. I thought wow way back here in this dirty cold water. I took several more casts making my way to the very back with no luck, again I was ready to get out of there. Then I had a thought, before I leave I have to fish a jig. On my first cast (which is the one cast that changed everything for me as far as targeting large bass) I got a solid bite, set the hook on a double digit fish which came out of the water and ran into a bush then broke me off. Now of course I�m thinking forget the crank baits I�m grabbing my jig stick and heading to the back of every feeder creek on the lake. I will make this already long story shorter by telling you I had 3 beautiful 8 to 9 pound fish on jigs that day, and all because I wanted to get warm by throwing a crank bait. That day I learned the importance of keeping an open mind and trusting my instincts, but most important was realizing that large fish feed in cold shallow water. I am sure they spend most of their time in the winter deeper, but depending on food availability they do whatever is necessary which often makes them unpredictable. So don�t let a temperature gauge keep you from having a great day. Brock: From that day on did you take a liking to throwing jigs for big fish? Gillespie: No, I�ve caught some large fish before on jigs, but that day expanded my season and time I would spend throwing them. I actually began fishing jigs as a young teen at Lake Casitas one summer on a family vacation in '69. I was hanging out at the boat ramp one day and this guy comes in with the first bass boat I ever saw. Man it was something else and it even had his name on the side. The guy gets out of his boat with the largest stringer of bass I'd ever saw all 2-4 lb. fish. A small crowd of people began to gather. Then a guy asked what did you catch them on. Then �Tex� (that was his name he also wore a big cowboy hat to) pulls out a handful of jigs and says these here. I make them myself and they are � a buck each. So I�m staring up at my new hero and asked if I could take a closer look, he hands me one. I then notice it looks just like the Bomber Jungle Bum Twin Spins (minus the spinners of course) in my tackle box back at camp. I�m thinking man I�m going to impress the heck out of my new friend by proving what awesome knowledge of bass fishing I have. So I say to Tex with the crowd around us this looks just like a Jungle Bum. Well that was a big mistake, he snatched the jig from me and yelled that is not a Jungle Bum, that is a �TEX JIG�. My new hero scared the hell out of me and I did not have � a buck on me anyways. I went back to camp and cut the spinners off my Jungle Bums and caught some fish on them that trip. So I guess I have to thank old Tex for introducing me to Jig fishing after all. Brock: On average how many days a year do you fish and how important is time on the water? Gillespie: That�s hard to put a number on since I�ve never kept a log. Because of my job in construction, I was able to bank my overtime hours in the summer and fish most of the winter and spring. When I lived in Castaic I was 5 minutes from the lake, so any time (and there were many) I worked a short day, then I was on the water. In the early 80�s Lake Isabella was my favorite lake until the mid-80�s when the great fishing vanished. I always regretted not spending more time there when things were so good. When things got good on Lake Castaic I moved there from the San Fernando Valley which was only 20 minutes away but to me that was too far. I was not going to have any regrets this time. My whole focus was to spend as much time on the water as I could. Back to your question. Including my time spent on salt water I would have to say there was definitely a few years with over 200 days a year and with regards to how important time is on water to me it is everything. Brock: Many books have been written about the crazed "Castaic Lake" and the hunt for the world record, what was it like fishing in this era and how long did it last? Gillespie: Well that depended on whether or not you fished on the weekend or during the week. Pretty crazy on weekends and not so much during the week. I�ll be nice and just say there were cases of rude and unethical behavior LOL. The world record craze started in the late 80�s which was before swim baits arrived, most large fish were taken on live bait. Personally I was never caught up in the world record chase. I just wanted to catch as many double digits while it lasted. 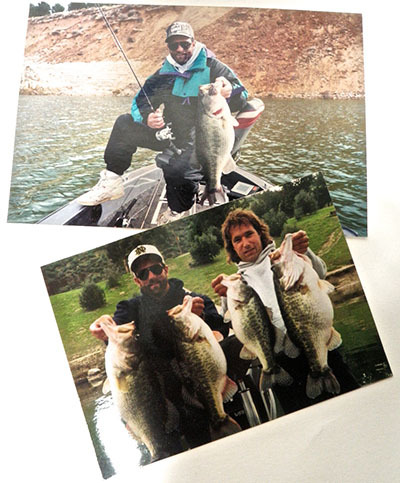 The swim bait era for large fish at Castaic didn�t last long, it was over by the Fall of '94. Stripers in the lake and no trout plants were probably the biggest factors. So I began to fish Lake Casitas which maintained a good healthy population of fish much longer than Castaic. I also fished the Castaic Lagoon which was very good until I left in 1997. Brock: With the Castaic Mini Mart being known as a place to swap stories and put your name on the board did you ever peak your head in and participate in this ritual? Gillespie: Now we are moving into the early 90�s. Since no one was fishing swim baits on the lake before that time, my answer to that question is no. When I began fishing the Worm King and AC Plugs, there were very few people fishing those baits. The local guides were earning their money fishing live bait. I quickly realized how effective these big baits were. I knew once it became common knowledge it wouldn�t last long on such a small lake. I tried to keep a low profile and catch as many of the large fish I could. I was having a blast! 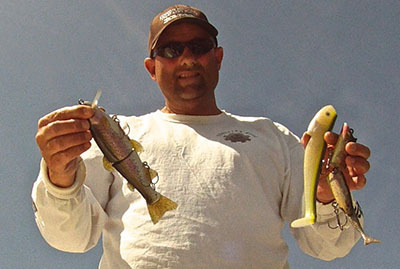 Brock: Did you notice a difference between fishing live bait and swim baits? Gillespie: Compared to my live bait fishing (crawdads and waterdogs) experience in my opinion swim baits blew live bait fishing away, it wasn't even close. Why sit on one spot all day waiting for a bite, when you can run and gun and catch several fish on multiple spots. Brock: What lures were productive for you at that time? Gillespie: Well you had the AC Types, Worm Kings in 6� & 9� sizes and also the Dinosaur, the Renosky Super Shad, the Castaic Trout and a few homemade�s. My favorites were the 9� Worm King, AC Types, and a Fat bodied Worm King style bait (which is a bait I designed having had great success with the 9� Worm King). The Fat one was very effective and also the Optimum which came a bit later. 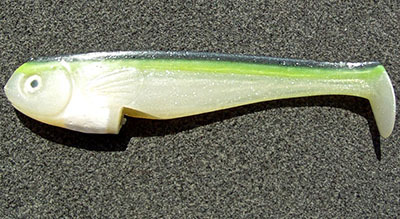 You know it's funny how things evolve, my fat body swim bait came from the Worm King which came from a 3.5" swim bait made by John Viasanko in 1983 (to mimic an Anchovy for salt water fishing), and his idea came from the Sassy Shad which was made in the mid 70's. I guess it just goes to show that fishermen are often trying to evolve old ideas whether they know it or not. Castaic, Zanks and a knock off AC Plug that was responsible for 80 fish over 10lbs! Brock: What kind of action or presentation did all these lures have in common? Gillespie: Well in those days you had rubber and wood. Until the term swimbait came up it only applied to rubber. 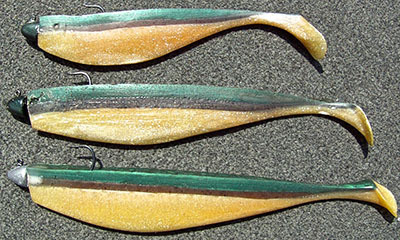 In those days I really looked for a tight action in both wood and swim baits. With wood baits I liked to fish them slow on the surface or just below. As far as my home made baits go, I often had to have several woods because after a couple hours they would absorb too much water and tend to go subsurface rather than surface. But there were times when the water logged baits would out fish the surface woods.